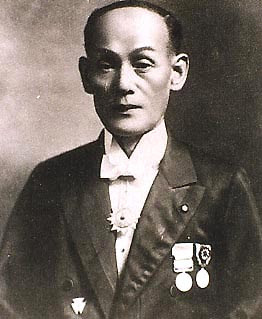 Yamaha Corporation was given the name of its founder, Torakusu Yamaha (山 叶 寅 楠, Yamaha Torakusu; April 20, 1851-8 August 1916). His father, a samurai of Wakayama Prefecture, is interested in astronomy and mechanics, and give their children a modern education. Yamaha studied under a British engineer, then completed an internship in Japan's first school of Western medicine in Nagasaki and took a job repairing medical equipment in the remote city of Hamamatsu. When a local school asked him to fix artificial Mason & Hamlin reed organ, he realized the potential of organ manufacturing business in Japan, and in 1887, he established the Yamaha Organ Manufacturing Company, the first producer of Western musical instruments in Japan, and build a reed organ The first portable. In 1889, the company employs 100 people and produced 250 organs each year. In 1899, Japan's education ministry sent Yamaha to the United States to study piano making and establish a supplier of materials needed to produce pianos in Japan. Nippon Gakki began making pianos upright piano in 1900 and first produced in 1902, applying its expertise in carpentry for making fine furniture. In St. Louis World's Fair in 1904, a Yamaha piano and organ artificial Award. In 1914, when World War I German harmonicas limited sales in Japan, Yamaha introduced the first harmonica and began exporting harmonicas worldwide. Yamaha continues to expand into the field of music. Facing the competition of Western-made musical instruments, acoustic Nippon Gakki opened the world's first research laboratory in 1930. In 1931, he designed a new Japanese Diet hall acoustics. In 1932, he began production of the pipe organ. During the 1930's, the expansion of the public school system in Japan created a demand for Western musical instruments, and Nippon Gakki began to produce competitively priced accordions and guitars. This yields the first acoustic guitar in 1942. During World War II, Nippon Gakki produced propellers for fighter aircraft, fuel tanks, and the wings, and finally stopped producing the musical instruments at all. New technologies learned during the war enabled manufacturing to Nippon Gakki cast own metal piano frame. In 1948, with the music business suddenly increased when Japan was mandated by the Ministry of Education music education in public schools. In the 1950s, Yamaha is the world's largest piano manufacturer. It also began producing audio components, and in 1955, he produced (Hi-Fi) record player. Nippon Gakki One of the main principle is to expand its business by finding new uses for the technology and materials available. After World War II, the fourth president of Yamaha, Gen-ichi Kawakami (川 上 源 一, Kawakami Gen'ichi, January 30, 1912 May 25, 2002), looking for new ways to utilize the company's manufacturing facility, began to seriously explore the overseas market. He visited the United States several times, considering the production of sewing machines, spare parts, scooters, utility three-wheeled vehicle, or motorcycles. Since financing for new plants rare, Nippon Gakki began research using new materials such as glass fiber reinforced plastic (FRP). In 1960, the company produced the first FRP sailboat, and then made yachts, patrol boats for Japan's Maritime Safety Agency, and oceangoing fishing vessels. FRP products, such as bows for archery, skiing, and immediately following the bath. Research to develop a lead alloy production equipment such as boilers and central heating systems for the construction industry. In the 1970s, integrated circuits (ICs) replaced transistors, and therefore can not find a match for the manufacturer, Nippon Gakki to build its own factory to make them in 1971. This allows the Nippon Gakki to meet rapidly increasing demand of electronic keyboards and audio components. In 1976, he opened a factory to produce large scale integrated circuits (LSIs) and converted all electronic products, such as the keyboard, from analog to digital format. Nippon Gakki LSIs are used to produce the first professional sound system and to produce new products for the consumer audio industry during the early 1980s. The DX-7 digital synthesizer, introduced in 1983, became the world's best-selling synthesizer. In the same year, the company began selling to other manufacturers LSIs. Research-intensive companies in the metal alloys for use in acoustic pianos had given Yamaha wide knowledge of the manufacture of light. This knowledge is easily applied to the manufacture of metal frames and motor parts for motorcycles. Kawakami and engineers visiting factories German to learn how to make motorcycles. Their motto is, "If you're going to make it, make it very best there is." The first prototype, Yamaha YA-1, named in honor of the founder of Yamaha, completed in August 1954. The bike is powered by air-cooled, 2-stroke, 125 cc single cylinder engine. Prototypes are put through 10,000 km of unprecedented endurance test to ensure that the quality is top class. In the first year of production (1954), built 125 Yamaha YA-1 (also called Akatombo, the "Red Dragonfly") motorcycles. The YA-1 was patterned after the German DKW RT125 (which has also been copied by the British munitions company, Birmingham Small Arms Company, as the BSA Bantam, and the Harley-Davidson as the Hummer). Success of the YA-1 resulted in the establishment of Yamaha Motor Co., Ltd. on July 1, 1955. The new motorcycle manufacturers produced about 200 units per month. In the same year, the YA-1 won the 125cc race at the two biggest events in Japan, the 3rd Mt. Fuji Ascent Race and the 1st Asama Highlands Race. The following year, the YA-1 won again in both the Light and Ultra-light classes of the Asama Highlands Race. In 1956, a 175cc single cylinder two-stroke models, YC1, is ready for production. In 1957, Yamaha began production of the first 250 cc, two-stroke twin, the YD1. In 1958, Yamaha became the first Japanese motorcycle manufacturers to enter the arena of international competition, and won an impressive sixth place in the Catalina Grand Prix race in the United States. Yamaha celebrities act quickly and begin to market motorcycles through an independent distributor, Cooper Motors, in California in 1958. 2008 AutoTronics Taipei & Motorcycle Taiwan Joint Opening: Yamaha Phazer at Fi Pavilion. In 1963, Yamaha developed the Autolube System, a separate oil injection system for two-stroke motorcycle engine, eliminating the inconvenience of pre-mixing fuel and oil. In 1966, Toyota and Yamaha teamed up to produce limited edition Toyota 2000 GT sports car, is still admired for its performance and expertise. In 1968, Yamaha launch Yamaha DT-1, the world's first true off-road motorcycle, creating a new genre known today as the bike path. Yamaha has since made a number of extensive two-and four-stroke scooters, on-road and off-road motorcycles. Yamaha XS 650, introduced in 1970, is such a remarkable success ended the British monopoly of vertical twin motorcycles. Today, Yamaha Motor Company is the world's second largest producer of motorcycles (after Honda). It also manufactures all-terrain vehicles (ATVs), boats, snowmobiles, outboard motors and personal watercraft. In 2000, Toyota and Yamaha formed an alliance that Toyota paid Yamaha Corporation 10.5 billion yen for a 5 percent stake in Yamaha Motor Company while Yamaha and Yamaha Motor each of the 500,000 shares of Toyota stock purchase. In 1960, Yamaha Corporation of America (YCA), then Yamaha International Corporation, was established to market a full line of musical instruments and audio / visual in the United States. YCA is a wholly owned subsidiary of Yamaha Corporation, Japan, and is the largest of all global subsidiary companies. A subsidiary of YCA, Yamaha Commercial Audio Systems (YCAS), founded in 2006, offers a growing line of commercial audio products for the United States and Canadian markets, and distributes Nexo speaker products. YCA another subsidiary, Yamaha Electronics Corporation (YEC), offers a comprehensive line of audio and video products in the U.S. home entertainment market. On October 1987, at 100 years, Yamaha's official name change to The Yamaha Corporation. In 1989, Yamaha shipped the world's first CD recorder. In 1988, Yamaha bought Sequential circuit and 1989-1993, bought a significant share (51 percent) of competitor Korg. It also acquired German Audio Software manufacturers Steinberg in 2004, from Pinnacle. After a period of financial difficulty during the 1980's, the eighth president, Seisuke Ueshima, began to reorganize the company in 1992. To market is almost saturated, Yamaha focused on high-end products, such as the Disklavier piano series, with built-in computer to record and play back performances, which can retail more than $ 30,000 and bring in higher profits. Ueshima encourage companies to develop new products. In 1993, Yamaha had launched the Silent Piano series, a good piano can be played as regular acoustic piano, or with their voice heard and only heard the pianist through headphones. This was followed by Trumpet Mute in 1995, Silent Drum in 1996, in 1997 the Silent Violin, Cello and Silence in 1998. The acoustic VL1 and VP1 virtual synthesizer, not a library that will store the sound is played back, using a computer model of the instrument itself to the producer a wider variety of sounds more authentic. On December 20, 2007, Yamaha made an agreement with the Austrian Bank BAWAG PSK Group BAWAG to purchase all the shares of Bösendorfer,  intended to take place in early 2008. Yamaha intends to continue manufacturing at the Bösendorfer facilities in Austria. Yamaha acquisition of Bösendorfer was announced after the NAMM Show in Los Angeles, in January, 2008. On February 1, 2008, Bösendorfer Klavierfabrik GmbH started operating as a subsidiary of Yamaha Corporation. Yamaha has become the world's largest manufacturer of musical instruments (including the "silent" pianos, drums, guitars, violins, violas and Celli), as well as a leading manufacturer of semiconductors, audio / visual, computer related products, sporting goods, household and furniture, specialty metals, machine tools and industrial robots. Yamaha has many subsidiaries and affiliates in overseas markets in addition to a number of related companies in Japan. Yamaha owns and operates several unique resort facilities in Japan that provides customers with the opportunity to enjoy leisure and cultural activities involving Yamaha products, including golf, motor sport and music.